The Parnall Plover was a British single seat naval fighter aircraft of the 1920s. Designed and built by George Parnall & Co. for use off the Royal Navy's aircraft carriers, it was ordered into small scale production, but after extensive evaluation, the Fairey Flycatcher was preferred for large scale service. 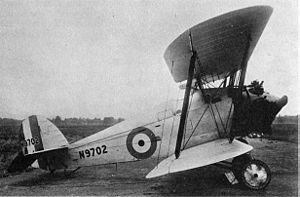 The Parnall Plover was designed by Harold Bolas, chief designer of the reformed George Parnall & Co. to meet the requirements of the British Air Ministry Specification 6/22 for a single seat fighter aircraft to replace the Nieuport Nightjar, powered by either a Bristol Jupiter or Armstrong Siddeley Jaguar engine capable of being operated both from the decks of aircraft carriers or as a floatplane. The Plover was a single bay biplane of wood and fabric construction, fitted with full span flaps, and could be fitted either with a conventional wheeled undercarriage, or, as an alternative floats (with wheels protruding through the bottom of the floats) could be used to allow amphibious operation. The first prototype flew in late 1922, powered by a Bristol Jupiter. Two more prototypes followed, with the second a floatplane, also powered by a Jupiter, and the third a landplane powered by a Jaguar engine. The three prototypes proved to be similar in performance to the competing Fairey Flycatcher, with small orders being placed for both types to allow more detailed operational evaluation. Ten Plovers were therefore ordered. Six of the Plovers entered service with 403 and 404 Fleet Fighter Flights of the Royal Air Force in 1923, allowing the type to be evaluated in service against the Flycatcher, and the Nightjar, which both types were planned to replace. The Flycatcher was preferred, being a more popular aircraft to fly as well as being easier to rig , replacing the Plover in 1924.